10 December 2010, at 10:43a.m. 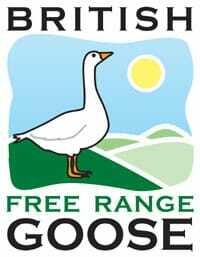 UK - A new brand identity for the British Free Range Goose is launched this Christmas — highlighting the green field lifestyle enjoyed by geese produced in keeping with tradition. “Nowadays they are typically reared through the autumn on grass rather than on corn stubble behind the harvest, but they do enjoy a very similar, natural lifestyle. The bright, new logo will become part of the promotional material used by BGP members on product literature and websites — and is already seen on the roadside signs by some of the first to take up the new brand image.